Size: 12.8(L) x 9.6(W) x 0.8(H) inches , fit A4 size and Letter size, up to 150-200 pages. 1. Each folder has 5 pockets，Provides a lot of space for storing important files or document. 2. Cute solid color smiley design, 4 colors can be applied to various occasions. 3.Each pocket has an organizational label for differentiation, ensuring that each part is immediately recognized for quick access. Perfect document organiser for home, office, school and business trip, simple and fashion. 1.If you have any problems, please contact us before open the dispute or give negative feedback, we will try our best to help you, thank you! 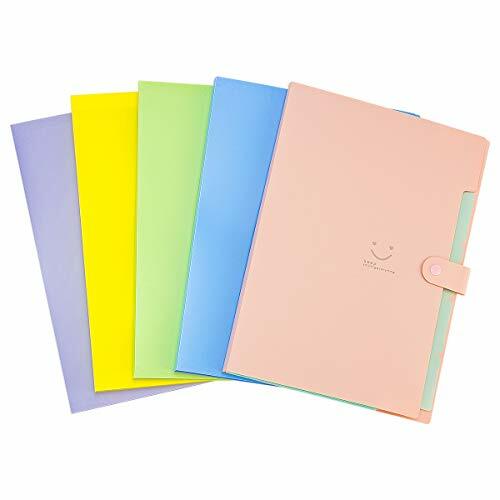 HIGH QUALITY MATERIAL: This colorful accordion folder made from quality non-toxic PP material that is waterproof and tear resistance, moisture-proof, durable and not easily broken. FILE FEATURES: 5 expandable pockets design allow you sort and organize some important documents, keep them tidy and improve your work efficiency. SIZE:12.8'' x 9.5'' x 0.7''.Accordion file organizer hold up to 150-200 sheets of A4 size ,sturdy and portable.Which help you save lots of time and more organized. UNIQUE DESIGN: The button design makes sure files not easy to fall and scatter, increasing the storage security . APPLICABLE OCCASION: Perfect for home,office ,school, and as a personal gifts, souvenir, business trip, simple and fashion. If you have any questions about this product by Apipi, contact us by completing and submitting the form below. If you are looking for a specif part number, please include it with your message.